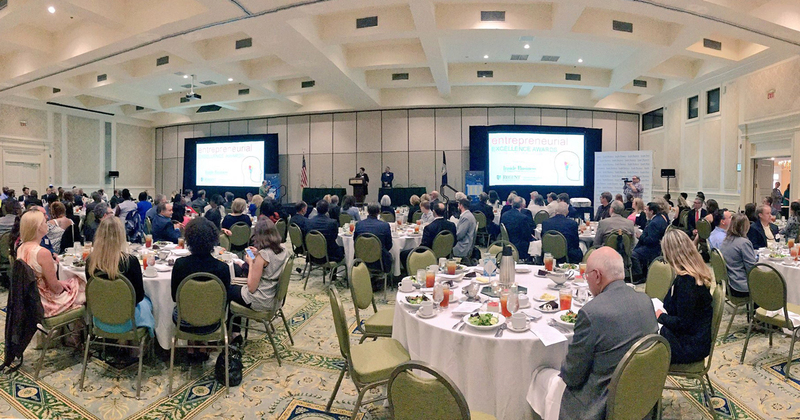 On Monday, June 11, Regent University School of Business & Leadership (SBL) and Inside Business hosted the annual Entrepreneurial Excellence Awards in celebration of the hardworking entrepreneurs on “both sides of the water” of Hampton Roads. Fifteen honorees, preselected by a panel of judges from various sectors of business, received resounding applause from attendees in recognition of their individual awards. In his address, David Arias, president and former owner of Swimways — a company that sells water toys — talked about his finding successes in business and entrepreneurship. Swimways’ annual growth goal, Arias added, was 8-15 percent. Eventually, his company reached the point where he started sharing its financial reports with employees as part of a push to give them a greater sense of ownership over their positions; to give them a tangible idea of how they were making an impact that directly affected and benefited them as employees. During a panel discussion following Arias’ address, panel members, including SBL Professor Dr. Gary Oster, IntellecTechs President Michael Harris, Divurgent CEO Colin Konschak, and Arias, shared advice and principles their experiences have sharpened and tuned. “The failure comes in not recognizing the talent” in one’s company, Harris warned. The panel also encouraged those present to grab ahold of innovative platforms, such as social media, to reach customers.